I don't know how many times I've cringed and winced in pain while watching Riley sleep in her car seat. Poor little thing always looks so uncomfortable, with her head flopping around and her neck bent in the most awkward of positions! Of course, I'm driving at the time and can't come to her aid either. Anytime she falls asleep like this, she always seems to wake up frequently and never gets a good nap. This means that as soon as we get out of the car, she is usually fussy and cranky! 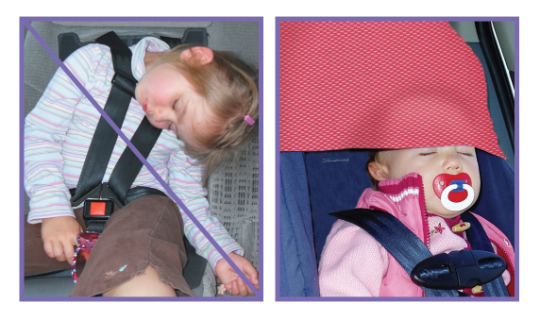 Melrose Kids Inc. noticed the same problem with sleeping children in strollers and car seats, and did something about it...they invented the Head Snuggler! Read on to find out more! I reviewed the Head Snuggler in Chocolate Mesh from Melrose Kids, which retails for $18.99. The Head Snuggler is an ingenious piece of material which simply slides over the back of your child's car seat or stroller. There are even well-placed holes which will allow the handles of an umbrella stroller to go through the Head Snuggler. Then, when your child seems sleepy, simply pull the Head Snuggler down over their forehead, as shown in the bottom right picture. That's it! Your child can sleep deeply and comfortably now and not wake up irritable and with a sore neck. Riley did take a little getting used to the Head Snuggler at first. She didn't understand why we were trying to put something on her head and kept wanting to take it off. Finally, we tried using it on her once she was already asleep and then she seemed to understand its purpose and immediately went back to sleep. We even tell her that it's her new "hat" and she seems to like wearing it now. Your child may need a few tries at using the Head Snuggler, but I promise that it will be worth it. Eventually, we want to teach Riley to pull it down for herself whenever she gets tired, but we're not quite there yet. Because the Head Snuggler is made of a durable mesh fabric, it is very breathable and won't cause your child's head to sweat. It is also very easy to make fit to any particular stroller, car seat or automobile headrest. Simply pull the fabric snug in the back and secure with a rubber band for a custom fit. I think this is an excellent idea to the age-old problem of your head flopping all around when trying to sleep sitting up. Disclosure: I received the Head Snuggler in Chocolate Mesh from Melrose Kids Inc. in order to facilitate my review. No other compensation was received. This product review is based on my own personal experiences with this item and is completely honest and objective.